This week Neuroapp team have found out an app to train social skills through “pretend play”, virtually! What’s pretend play? pretend play is a form of playful behavior that involves nonliteral action. In this type of game children use objects or invisible objects using their imagination and creating a game with stories on it…have you ever played to be a pirate? tha’s pretend play. Pretend play foster symbolic thinking (mental representation of objects, situations), theory of mind (capability to interpret people thoughs and feelings) and divergent thinking (thinking about different alternatives, posibilities to apply in a situation or problem-solving). 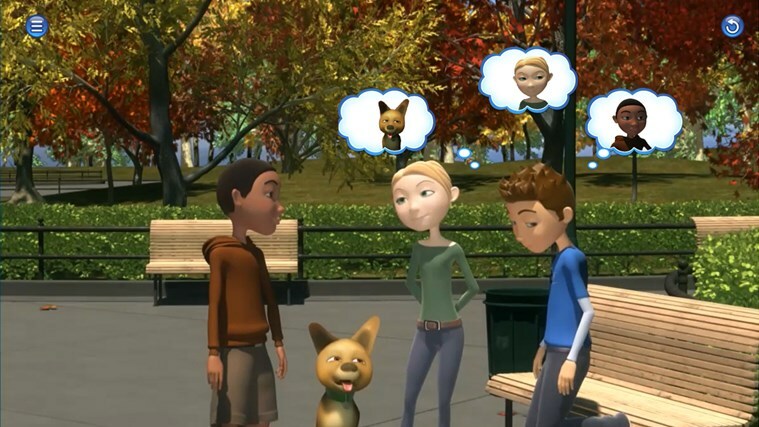 My PlayHome is a virtual playhouse that encourage kids to make up their own stories, they can chose different scenarios, select different objects and chose how character (e.g children, family members…). Also it is recommendable to teach routines. We suggest it from 3-5 years old or with children with atypical play or difficulties on social skills such as autism. There is a free version (lite) and other complete (4,49euros). We can not forget the emotions in the intervention with children and adults. Today we recommend you an app to improve this aspect. Drawing Mandalas help us to focus attention and it is a good indicative to express feelings by choosing different colors. Besides, it helps us concentrate and improve thin motor skills. Painting is a good exercise to relax, to rest mind and senses acroos its imaginative forms and figures. For their simplicity, they are apps recommended for any age. They exist both in the Apple Store and in Google play a great quantity of applications for different ages and variety of drawings difficulty. In addition, the majority of them are free. This week we let you know an application developed by Tap mobile for children with autism spectrum disorder. With “How are you?” app, you can train facial expressions recognition implied in emotions such as surprise or feelings such as falling in love, hapiness..
Game consist on selecting expression of eyes, mouth, eyebrows… which macthes with a concrete emotion or feeling. Solution can be seen to learn it in a concious way, and, finally, make us a photo imitating that emotion or feeling. Pictures can be saved, you can have an own facial expression album! Very useful for children aged 3 to 6 years old. If you want to know more apps with people with this difficulties, do not forget to visit our Autism section! This week from Neuroapp team we want to let you know an application to train relaxation and reflexivity for toodlers. Breathe, think, do with Sesame is an app where children has to help monster to relax, think and behave on frustrating or extressing situations (for example, not being able to fit shoes by oneself, having to leave mama when enter at school and so on). For that, it shows how deeply breathing helps to relax, and, stop to thinking a few seconds helps to find solutions. Once children select a solution among different options it can be seen how monster stay finally happy. Is an atractive app for toddlers and very useful for those who tend to frustrate and behave impulsively. This week we recommend you an app called “Peak-brain games”. This app has been choosen best app of the year 2014 in more than 24 countries. With this brain training app you can train skills such as attention, memory, language, reasoning, executive functions, perception and emotion processing. There are more than 40 exercises which will help you to improve those skills; more over, it offers to user the posibility to fit the program according to his age and follow his own evolution compared to other users as well. One example of their working memory games consist of remembering in a grid some dangerous boxes, once they are hidden user has to trace a path to join two points avoiding dangerous boxes. Free version proposes some exercises each day of training. Purchases allowed though suscrpition. This week we have chosen an attention training based on oriental psychology: relaxation as training of focus and awareness dicreasing anxiety as well. In Braineka attention deficit you will find a module called “deep relaxation” where and audio will guide yo to relax (breathing, being aware of our body, for example, tensing and relaxing different body parts, visualizing pleasant words and so on). This app as weel as other developed by Braineka to train attention, fears and so on we consider them as complementary tools not substitute of psychological therapy. Good morning Neuroapp followers! This week we show you a fantastic app to train emotional and social intelligence skills for children, such as frustration tolerance, impulsivity control, selfcontrol, social problems solving (assertivity) and emotions recognition. Gomins is an app developed by psychologist (Álava Reyes centro de Psicología in cooperation with Universidad Autónoma de Madrid). It is an app developed for children between 3-10 years old to improve their emotional skills. Gomins is an interactive app children and parents because provides information about child performance compared to other users with similar age. In this way the child’s parents can be aware of child weaknesess and strenghts in these skills (impulsivity control, frustation tolerance and so on). This could be a good reference to motivate child to reach different “missions” through the game fostering his abilities. Besides, scoring systems and other activities recomended from Gomins app can be implemented to reinforce social and emotional intelligence in daily life (for example, readind a concrect story to better understand self control). Games are simple and user friendly, for example “fruit festival” where user will obtain energy for his Gomin (mascot in the game), child has to pick the fruit when it is ripe enough, waiting to obtain better benefits. In this way we train self control. If the result is very low system provide some questions for parents to check child performace of these abilities in daily life, for example: “when losing a game, apart from giving up themselves,their anger is out of proportion and stamp their feet”. Available for IOS and Android operative systems (price: 4.99 euros). New week in Neuroapp where we show you an application based on neuroscience. This app reproduces the famous test “Iowa Gambling task” (Damaso, Bechara and Anderson). This task stimulates real-life decision making process under risk. In this process not only executive functions are implied in the sense of probability weighting according to an incomplete information, but emocional factors. Task consists on making 100 decisions within the objective of gain money as much as possible. For this, you should chose among four stacks of cards (A,B, C, D). Two of them used to be more profitable than others (provide more money) but also more risky (loss of money could be elevate), the others options used to be more stable (gains or losses are more equilibrated).From time to time distribution can change randomly. At the end you can see the amount of money gained. You can also receive via email charts where analyze type of decisions made (more or less risky). We love it! Hope you enjoy it! This app is a game created by developers of IBM Argentina, in the “On Demand Community” Corporate Citizenship program. It has been developed for ASDRA (Down Syndrome Association of Argentina). This app stimulates the emotional area in children by recognizing everyday situations. Child selects faces that represent emotions describing the scene and dragging them from the initial position to them final one. If movement is correct, the game continue with a new scene, otherwise, face returns to initial position. Since the app has a lot of scenes, we recommend to use this game, not only to identify the emotion but to work with the scenes understanding and analyzing each of the images displayed. Therefore, we do not use it exclusively for the purpose of identifying facial emotions but to increase Children communication and social reasoning skills. People who have difficulty in these areas (emotion recognition and understanding social situations) are very often people with ASD, but this difficulty can also be found in other syndromes or disorders such us ADHD, SLI, Down Syndrome, people with prosopagnosia, brain damage, etc. For all these cases, “Tuli Emotions” is a great tool to help to understand social situations. We recommend this app from 3 years. 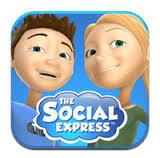 This is an aplication with excelent graphics, very usefull to maximize social skills. It contains 16 lessons and 30 different scenes. Each lesson presents daily interactive social situations using video modeling, “hidden rules,” and suggestions for problem solving into daily life. You can improve aspects such as eye contact, understanding others emotions, managing angry situations using different strategies, problem solvin…, with basical instructions for beginners to more complex intruction for intermediate users. It is an app designed to work in the classroom with autistic children. Thus, multidisciplinary work of different professionals in the center ( Professor of Special Education and the student tutor) is required. The app is recommended from 8 years. Disadvantages: It is only available in IOS operating system and the application is only in English. But it also offers the possibility to download it to your PC. The app is priced at $ 4.99 per month or $ 53.89 a year. Have a great great week! See you soon!